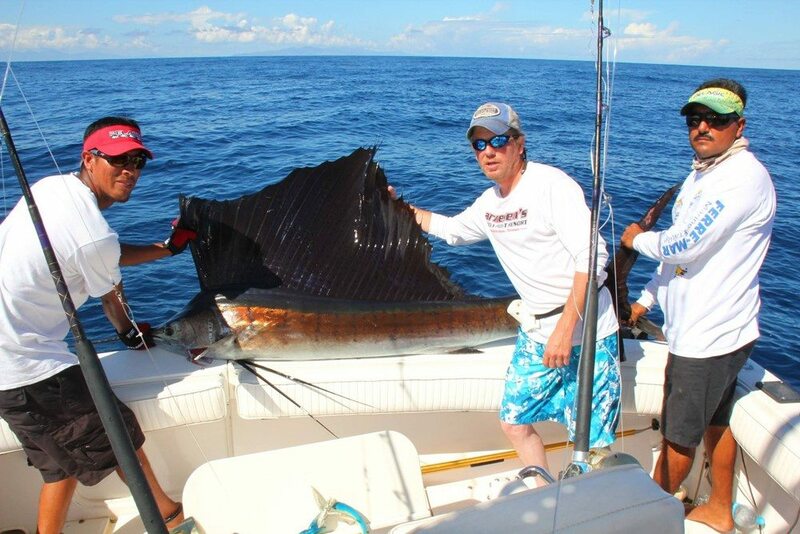 During the past few weeks this month, fishing success on the East Cape has been “as good as it gets” for many of the favorite species that draw anglers from all over the world to our Sea of Cortez fishing grounds. You really can pick from a list of the BEST big game fish and expect to catch any of them during a day on the water right now. Striped marlin, Pacific sailfish, blue marlin, yellowfin tuna, dorado, wahoo, roosterfish, and even swordfish have been caught by our guests this June. When you add inshore action for tasty species like pargo, cabrilla, and sierra, plus jack crevalle and pompano, you have a lineup of fish that’s sure to please any sportfishing angler! Yellowfin tuna are a huge attraction right now. While consistent numbers of 15-40# ahi have been filling coolers and adding to the plates of sashimi being passed around the pool bars at the hotels, in recent days the GIANTS have started to appear. It’s not often that we can brag about such big tuna–especially in June–because these special fish roam huge swaths of the Pacific and only enter our fishing grounds periodically. Fish weighing 313#, 213#, and 148# are examples of tuna caught by anglers fishing with our hotel fleet this week. The multi-hour battles with beasts like these make for some grand fish stories that will endure for generations. Big tuna need lots of forage, and the incredible swarms of bait in the Sea of Cortez are attracting other apex predators as well. In lockstep with the tuna schools, the arrival of big blue marlin (and occasional black marlin) signals the absolute peak of our fishing season. Lots of nice blues have appeared, and anglers are catching and releasing numerous fish in the 200-400 pound range, and our biggest so far this year was estimated at 650# before release. In addition, striped marlin and sailfish also are being hooked and released in consistent numbers. Wahoo have been ranging in size from 20-60#, and lots of dorado are being caught in the 15-40# range. Big pargo are snapping inshore, and some big ones are even being hooked right around our fleet’s moorings just in front of the hotels! Roosterfish have been adding to our reputation as “The Roosterfish Capital of the World” as well, with fish 50-90# being caught along with many smaller ones. If a roosterfish is on your bucket list, you can’t pick a better time to visit the East Cape! In fact, if just plain WORLD-CLASS SPORTFISHING interests you, we ask: why aren’t you making travel plans now? What is the water temp in Cabo San Lucas & the Sea of Cortez? East Cape Resorts © 2019.